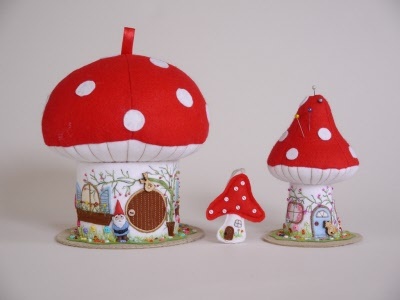 How delightful are these little toadstool houses designed by Gail Penberthy? The detail in them is extraordinary and they have already proven to be a huge hit with our customers. You get ALL THREE kits! That's right- you get the patterns and supplies to entirely make ALL THREE ITEMS! Keep them together or gift them individually as heirloom collectables. The large toadstool house has a removable roof, to reveal a small storage area and and includes a hidden needlecase. The medium one is a delightful pin cushion and the small one is to attach to your scissors. They are approx 7 and 5 1/2 inches tall. Kit includes felts, pelmet vylene, fabric, some buttons and beads along with the patterns to make ALL THREE ITEMS. The training and instruction takes place over one day at our dedicated training facility in East Sussex. You will leave the course with either a completed project, or the necessary expertise to expedite a successful completion. You will also be provided with a certificate of course completion. A light lunch, tea, coffee and biscuits are all included free of charge!